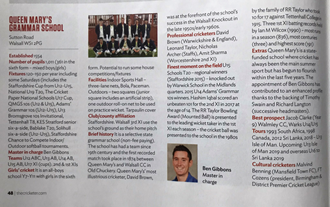 We are delighted to announce that we’ve been selected by The Cricketer as one of the Top 100 Schools in the Country for Cricket in their publication entitled ‘Good Schools Guide 2019’. The publication of this top 100 follows an exhaustive process that saw more than 350 schools submit entries to be included in the guide. All entries were judged against an extensive set of criteria which included details on facilities, fixture programmes and coaching schedules. This is a remarkable achievement for the school as the guide only included 13 state/state grammar schools, with the remaining successful entries from independent schools. Head of Cricket Ben Gibbons commented: “This is a remarkable achievement and we are incredibly proud of our inclusion in the Good Schools Guide for 2019. It would be amiss to overlook the valuable contribution of various members of the Games Staff who continue to give up their own time to take various fixtures and for the support for successive Headmasters who have provided the platform for cricket to flourish within the school. 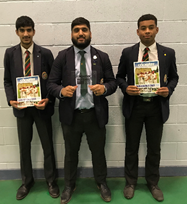 However, we will not rest on our laurels and it was great to see the support from both pupils and parents at the inaugural Cricket Awards Evening in October which raised £1274.50, as we endeavour to improve our current cricketing facilities within the school”. They say it is important to put your best foot forward, and I think during this first half term, QM has done exactly that! Individually, pupils have made an excellent start to the new academic year and as a school QM has not failed in making a positive start to the year. To begin, it would not seem correct that QM forgets its infamous “one pound man” in David Pearce, this term we received great news of his successful bursary to Cambridge University. As a friend of David, I wish him all the best and every success for the future! Don’t think for one moment though that means there is nothing to report for those of us still at the school. Sai and Kush Nathwani of year 11 represented QM in the 10th China Bridge International Chinese Speaking Competition in Kunming, China, an outstanding achievement. Moreover, it exemplifies QMs dedication to providing opportunities that have a rich impact on her pupils. In the same theme of achievement, I am pleased to inform you that our new fusties recently graduated as Roman centurions due to their participation in a Roman activity day run by the history department. I have received excellent reports on both the fun and educational element of the day and one I hope QM continues to run in the future. It is not only ancient sport where QM excels, various reports of our sporting achievements have been heard in assembly alongside a very successful futsal competition ran across all years and a girls competition. The tournament was enjoyed by all and once again, was one I am sure will prosper in the future. The two big events on last term’s school calendar were the annual Old Boy’s Dinner and Speech Day. The latter, was as vibrant and successful as ever, the PSLT gave their speeches with gusto; the guest speakers inspired out future medics and the evening was exactly what it should have been: a celebration of all that QM can do. The prize giving moved to a new location this year but lost none of its charm and atmosphere of pride. I would personally like to thank all prefects that helped with running the day, congratulate Ms. Roberts-Gawen on the successful operation of Speech Day and to pay tribute to our excellent performers. In particular, the chamber choir who were a new, most welcome edition. The Old Boy’s Dinner had a similar atmosphere, old boys of the school from as far back as the 1930s gathered in the school hall as an act of tradition and tribute to celebrate our rich history. The evening was an overwhelming success that made everyone present truly understanding of what it meant to be a Marian and was a great privilege to the current pupils allowed to attend. Commander Punch was an excellent honored guest speaker who I learned a great deal from sitting next to for the evening. I am delighted to announce, that my speech was not fluffed or greeted with too much heckling concluding in what was a truly spectacular experience. To surmise, this first half term was really to busy and successful to account for everything in 500 words despite all my best efforts but this is only tribute to the amazing work of pupils, parents, prefects and of course staff. I can only wonder what I will be writing about next half term, but I know that it will be just as successful as this one just gone. It is an honour for me to be able to welcome all pupils and teachers, new and old back to the school for the start of what promises to be yet another exciting and successful year in the life of the school. To introduce myself, my name is Kodi Beveridge-Smith and as this year’s Captain of School I look forward to tackling my roles and responsibilities throughout this year, both challenging myself and improving the school. Currently, I am studying History, Geography and English Literature with my overall target being to read History at Oxford University. Throughout my six years at QM, getting involved with the drama productions, the many foreign visits and by making Farchynys my second-home, has enabled me to grow as a person. Thus, I hope to be able to promote these fantastic opportunities to other pupils within the school so they can share in the pride of being a part of such a school. The pinnacle of my school career will undoubtedly take place this year as aside from my duties as CoS, I will be leading the cross-country team and be taking up the role of Senior Cadet within the CCF’s Army section. The highlight of my time with QM so far came this summer, as I was able to spend six weeks in Canada in a once in a lifetime timetable of adventurous training. With a new year comes new additions to the teaching team ensure QM continues to show academic excellence. I would like to take this opportunity to extend my thanks to the teachers that are departing for their outstanding service to the school. It would seem that QM’s work is never done, not only was the CCF active this Summer, but a party of pupils from across the school spent the Summer in Borneo. These ambassadors climbed Kinabalu Mountain and took part in valuable charity work; giving back to the community they were welcomed by. 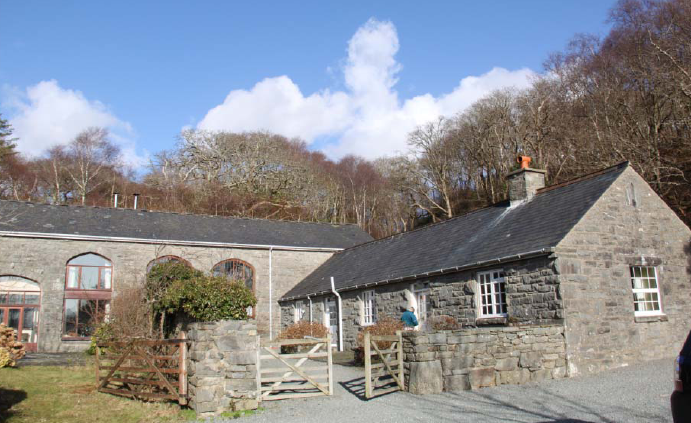 In addition, Farchynys recently hosted an event welcoming old boys back and members of the QM community to launch the “Marians on the Mawddach” book written by Paul Walton. Through this, we are able to celebrate our heritage whilst looking forward to the future of being able to offer pupils the gold standard in outdoor education. Finally to add to this, A-level and GCSE results still continue to be impressive at QM proving that it is possible to be “all work and all play”. For the latter part of last year, the new PSLT team took up the challenge of their new roles. Francesca Adams as Head Girl, Sam Shackleton, Pavandeep Josan, Bethan Withey-Tucker and Oliver Mills as Vice Captains and Ben Hopton teamed with Abazz Shayan-Smith head up the House System. Already, we have proven our ‘metal’ in the Year 6 open evening, which was an outstanding success. In addition, the 6th form induction event went down a storm with the new external sixth formers. With such an outstanding team around me, I am truly very excited for what the next year has in store. This term always seems to be the most international in outlook, with trips all over the world. It has been the end of an era for one of the most loved. The Alabama space camp has been run for several years now, but with next year being used to explore Florida instead, and Kennedy’s international space station. The main highlight from the assembly on Alabama seemed to be the building of friendship over the week that was spent there. Whilst the Lanzarote diving trip seemed to provide an unforgettable experience to all that went. Meanwhile we had visitors from Ireland, Holland, the Czech Republic and Turkey, looking at how the school helped enrich STEM subjects. This term has also been a highlight for STEM achievements. It was a proud day in London when as part of the Senior Maths Team we came a respectable 65th in the country. Meanwhile in the DT department Irfhan Ahmed’s commemorative plaque to Charles Bonner VC was recognized at the school by building a brick plinth outside the Collier Centre. Despite “Bassett” having a more sudden end than the cast had wanted, due to unforeseen circumstances, the cast and crew of were treated to a truly enjoyable production of “A Midsummer Night’s Dream” at the Royal Shakespeare Theatre in Stratford. On behalf of all the cast I would like to thank Miss Slater for all the hard work that she put into “Bassett”, as well as giving us a memorable experience of a professional production. There has also been great individual national success in sport from Zac Elliot, who was crowned national England Champion in the long jump in February and then won silver medal in Indoor Pentathlon in March, clearly a very impressive achievement and shows great potential for the future. Sport has been a major part of my life within the school. Hence, the highlight of the term for me was the end of 7 years of school rugby which culminated at the Staffordshire 7s tournament. We ended up in the semi-final of the cup before being knocked out, which was a great way to end our school careers for all the 6.2s who played. It seems almost surreal that I’m writing this blog during my last ever week at Queen Mary’s. From looking up to almost everyone in the school, I am now coming to the end of my final year, in which I have overlooked the whole school from the position of its most senior pupil. The amount of change since my first year as a ‘Fustie’ is nothing short of remarkable. The spring term activity has only reinforced the degree of change. This term is the one most often associated with the ‘International in Outlook’ pillar of the school; and while the two main February half term trips took place, the traditional Alabama Space Camp was replaced this year with a trip to Florida and the Kennedy International Space Station. The trip was with QMHS for the first time, as was the ski trip to Canada. The World Challenge, which I was fortunate enough to go on myself last year, has changed its location to Borneo for this summer’s expedition. The students visited the Peak District on a training weekend this term in preparation for what I’m sure will be for them, as it was for me, the most difficult but rewarding thing ever to have done. It is always refreshing to see opportunities available to all members of the school to broaden their experience through travelling for the purpose of a challenge. While the annual, well-organised CCF Overseas Camp in Cyprus was a success as usual, closer to home the students on the CCF Adventurous Training camp in Farchynys started a new chapter in QM history by being the first guests to use the new cottage, recently purchased through the support of the QMA. Securing this substantial property for generations to come is one of the great success stories of this school year, and exemplifies the considerable changes that have taken place in different aspects of school life over my seven years here. Another of the highlights of this term was the promotion of mental health awareness for the first time, during national Mental Health Awareness Week. Presentations on the topic were made in both year and full school assemblies, ensuring all members of the school were informed about an extremely important and relevant subject. For the sixth form, Mr Matley organised a brand new UCAS afternoon, where some leading universities and employers offering apprenticeships came in to run a workshop and deliver presentations. I’m sure this was invaluable for members of Year 11 and Year 12, and added to the numerous events the school runs to assist students with post A-Level choices. It is wonderfully reassuring as my time here comes to an end to see the school continue to expand horizons and offer new opportunities. I would like to give my thanks to all the members of staff who have made QM such an enriching experience for me, both academically and in terms of developing key life skills; and I wish the new Captain of School all the best for what truly is an extremely rewarding role. It gives me great pleasure to introduce myself as the new Captain of School. My name is Nayan Bhagvaker and I’m currently studying Maths, Further Maths, Physics and Economics, with the ambition of reading Economics at university. Within the school I play hockey and cricket, and take part in numerous clubs and societies. My standout extra-curricular event this year will be captaining the school in the prestigious Target 2.0 competition. The school hall accommodated almost 1000 people for the first assembly of the year. 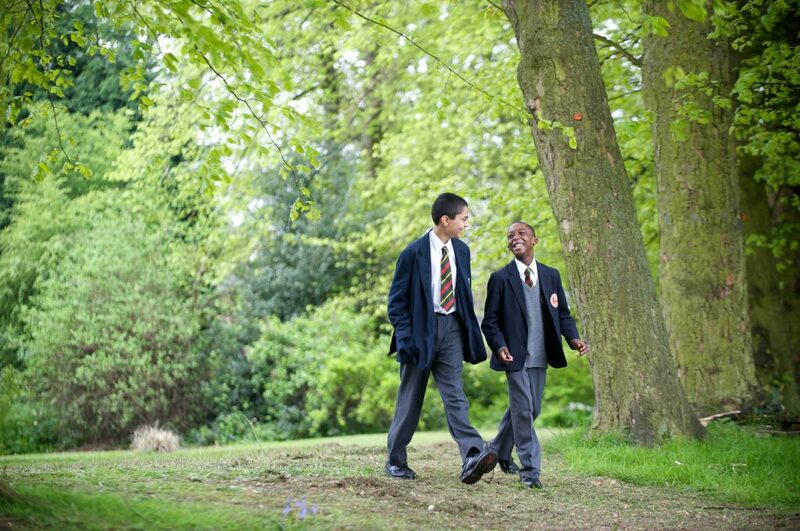 Along with 150 new Year 7s, there are now well over 150 Year 12s. Both sets of new students have settled in well, with the new-look induction programme for the year 12s run successfully by the new head of sixth form, Mr Mately, who has succeeded the long serving Mr Donnan. To add to the already formidable list, new opportunities are still being created within the school. Notably, this half term saw the successful introduction of the girls’ house futsal competition – yet another example of diversity within the school community. The new Music Suite has also been a huge hit, especially with the younger members of the school. It is great to see students being given excellent facilities to develop and express their musical talents, alongside their academic studies. Despite it seeming like much has been changing around me, my role and activities have stayed very similar to those previously reported by my worthy predecessors. These involve assemblies, duties, events and of course, the Old Boys Dinner – without a shadow of a doubt, the hardest address any Captain of School has to give. Fortunately, my speech went extremely well; and I was able to relax and enjoy the evening, which itself was a wonderful and unique experience, in terms of hearing stories and learning about the tradition of the school, and speaking to Old Boys who had been at Queen Mary’s as far back as 1935! Following on from the traditional date of the Old Boys’ Dinner was of course the closing event of the first half term – Speech Day – the most prestigious event in the School’s calendar. This year, each member of the pupil senior leadership team addressed one aspect of the school’s four pillars, pastoral charter or motto. This allowed the wide range of successes within the school over the past year, from the School’s Mandarin excellence programme to the individual successes of Zak Elliott and Greg Cornes, to be publicly recognised and celebrated. I look forward to reporting in a future blog on an equally busy, yet equally successful, second half term. 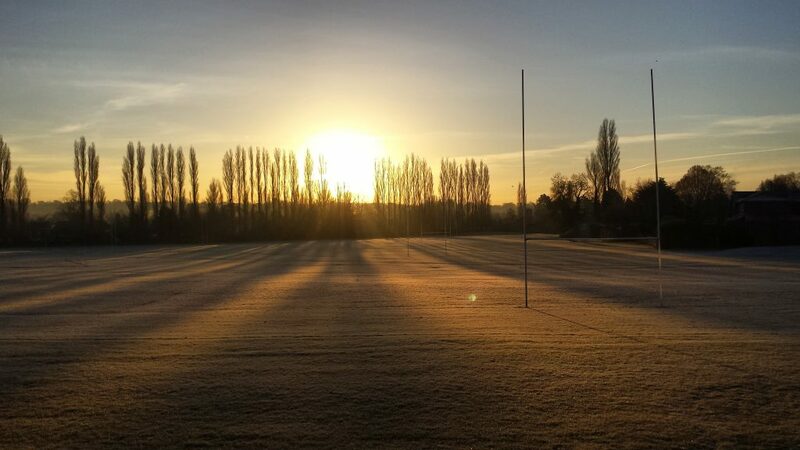 It has been yet another tremendously busy term; it seems that every term is increasingly full of success and new innovations, alongside more familiar school traditions. Once again the school took a large group of students to the Space Camp in Huntsville, Alabama. The group represented the school superbly and to the envy of myself and much of the rest of the school had some truly unique experiences, using the only B52 flight-simulators not in the hands of the US military as well as flying their very own space mission. As part of the rugby 1st XV, I have thoroughly enjoyed the rugby 7s season and it culminated in a superb victory in the Staffordshire Plate. However the success of the Year 7 rugby teams, coming 3rd out of 30 teams in the Staffordshire Cup is an impressive feat, and it is good to see the success of the seniors emulated by the junior teams-they certainly have a promising future ahead of them in school rugby. It doesn’t seem like a whole year ago that I was on my Geography field trip in Farchynys, however two groups of 61 students have now completed their fieldwork in preparation for their exams in the summer. Project Horizon have also scheduled a launch from the coach house in the summer term but have also been working hard closer to home. The team of ‘experts’ presented the project to members of the public at the Thinktank in Birmingham, and have also been invited back next year, a huge reward for the last few years hard work. One highlight of the term was a donation of a plaque recognising the school’s new Confucius classroom status. It recognises excellent teaching of Mandarin Chinese in the classroom and the opportunity to promote teaching of the subject in local schools. Members of the school community have also received national recognition in Mr. Sunley’s Tenner Challenge. A special mention should go to Jay Sikka who despite annoying much of the sixth form with his ‘Café 6 express pass’ , was rightly highly commended for his enterprise. The open evening towards the end of the term provided the school with an opportunity to showcase the successes of the term, and Mr. Vause’s band did well to prepare for the Spring concert which was also a huge success. As my last open evening it filled me with a sense of pride to see the changes and successes on display since my first open evening, spent guiding visitors around the school. However, perhaps the most publicised successes this year have been those of the DT department with Irfhan Ahmed’s commemorative plaque to Charles Bonner VC being unveiled in Aldridge, a great success for him and the school. It does seem inevitable that at some point the name ‘David Pearce’ is going to come up when describing this term. I would like to congratulate David on his fantastic achievement on designing a side of the new £1 coin. This seems to be a fitting way to celebrate yet another busy, successful and enjoyable term. Finally, it was a pleasure watching the staff well and truly beaten by the sixth form side in this year’s charity football match, raising money for a great cause, playing in a fantastic match and seeing off a truly amazing term in style. This term (if you can call it that) was actually only a few short weeks in school for 6.2, as the countdown to exams and leaving intensified for the upper sixth. Sport at school is usually restricted to just cricket at this time of year. However, not only has one the most ambitious cricket schedules ever seen at the school materialised under the leadership of Mr Gibbons, but the return of Mr Taylor has allowed the sports department to offer competitive tennis and golf lessons to members of the community who may not usually be involved in summer sports. The CCF also played to Air Commodore David Prowse for its biannual formal parade, as he visited to inspect the contingent. He went away very impressed by the commitment of both officers and cadets alike and on the whole, the parade was a huge success. The first year seven Farchynys weeks also took place as seven years at Queen Mary’s came to a close, adding to the nostalgia no doubt experienced by all of those that will be leaving. My time at Captain of School has been the busiest of any of the seven years I have spent at the school in terms of the sheer volume of things that continue to go on at school. It is clear from my time that the school is continuously changing, and progressing, and I am extremely proud to have been a part of that progress. Finally, I’d like to wish Liam O’Connor the very best of luck as the newly appointed Captain of School. I know that he possesses the necessary character to do an exceptional job. This half term was another extremely busy one on both academic and non-academic fronts. It began with, arguably, the biggest QMA event of the year – the Fireworks evening – except that this year, the event was moved to early evening, with the aim of making it more ‘family friendly’. This change, as well as the traditional raffle and wide array of fun games and stalls, made it yet another hugely successful event. The following weekend saw the CCF’s annual Remembrance Day parade. The contingent conducted themselves extremely professionally, paying tribute to those who had fallen, as well as representing the school and town with pride. Every day at Queen Mary’s presents new opportunities. Nevertheless, this half term was outstanding in terms of the supra-curricular activities that have been available. Students of all years were given the chance to broaden their academic horizons through Philosophy, Politics, Art and DT trips, to name a few, and also display their academic talents in a variety of events, including the Maths and Physics Olympiads and the Chinese speaking competition. In terms of house and sporting competitions, this half term saw the start of house basketball and the much-dreaded house cross country. The term ended with the extremely enjoyable Carol Service on the final Wednesday evening, and Christmas assembly on the last day. Having not attended the Carol service since Year 8, I was pleasantly surprised at the impressive flair of Mr Vause and Miss Sullivan, with the joint talents of the QMGS and QMHS choir and band executing an assortment of impressive works. The Christmas assembly ended the calendar year in high spirits with Mr Matley’s quiz and the Skiffle group, in particular, failing to disappoint. I look forward to reporting on hopefully another term full of opportunities and successes, despite it being my own last full term at this school. It is a strange feeling being in upper sixth knowing that a few weeks of school in the summer term would be the last you’d ever have. There was a slight air of sadness that 7 years at Queen Mary’s were coming to a close but it also seemed like it was the right time to end. However, finishing lessons was only the start of a month long exam period which would be filled with stress as it determined the futures of year 11s and sixth formers alike. The leavers’ party put together by Mrs. Wood went ahead very successfully. Entertainment was provided via a well-put-together photo montage by Daniel Bachynskyj-Bilas, and everyone had the chance to collect their leavers’ hoodies whilst signing each other’s shirts. Being Captain of School was a great opportunity that I am proud to have undertaken. The experiences gained are invaluable and have put me in good stead for the challenges of University. Additionally, I was pleased to break the trend of School Captains always being rugby captains/players, if only for one year. Lastly I would like to take this opportunity to congratulate Reece Bhatoe on his appointment as our new Captain of School, and wish him the best for the year ahead. I have no doubt he will succeed in this role and I shall enjoy listening to his speech at the Old Boys’ Dinner later this year. The previous half term was yet another busy one for school, with many successes being celebrated throughout. Indeed two of the biggest events for school came within the same weekend this year. The annual QMA’s firework event was yet again a huge success making record-breaking profits for another year running, despite the CPA being out of use due to the building works. There was a huge effort from everyone involved including all those on the QMA, as well as all the 6th form helpers, and I’m sure the profits made will be put to great use within the school. The following day after the fireworks event was Remembrance Sunday and the huge turnout from our CCF made up a very large proportion of the parade. The way everyone conducted themselves and the large crowds that gathered round Walsall’s cenotaph made it a very poignant morning remembering those that had fallen. It was another successful half term for sport for the school. Despite some losses for the 1st XV we have continued to grow as a team and have produce some great performances throughout the half term. There has been continued dominance in cross country from QM with some great wins both individually and as a team. One of the highlights of the term for me was the carol service in the town hall. Not having been in attendance since year 8 (I definitely feel like I have missed out since being at this one), I was unsure what to expect. This year the choirs and orchestras of QMGS and QMHS were merged into one large one under big plans from Mr. Vause and Miss Sullivan. The event was a huge success with the town hall full of parents and students of the school. The performance of both the choir and orchestra made it a thoroughly enjoyable evening for all, and I am very much looking forward to the spring concert next term. The term finished with what is now QM tradition. The christmas assembly featuring Mr. Matley’s quiz, as well as one of the most interactive skiffle group performance so far, making it a big hit with the rest of the school. I’m sure next term will again be full of success and surprises, but it will surely go too fast for my last full term at QM.